Because glass sticks to surfaces when it gets hot, a separator is needed between kiln shelves and glass to protect both from damage. Shelves can be protected in a couple of ways - either by using kiln washes or primers, or by using specifically designed kiln shelf papers. Both methods have advantages and disadvantages, which relate to cost, ease of use, the finish achieved, reuse, and potential health hazards. Kiln washes and primers are significantly cheaper than kiln papers. 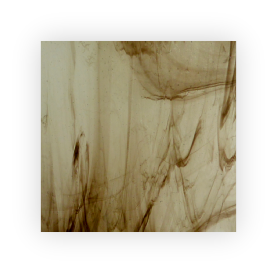 However, kiln papers are very easy to use, whilst kiln shelves have to be stripped clean and kiln wash re-applied and cured every time a kiln shelf is used. This can be a messy and time-consuming process. Generally speaking, kiln papers can only be used once, but according to the manufacturer of PAPYROS, a few firings can be achieved with very careful handling of its product. 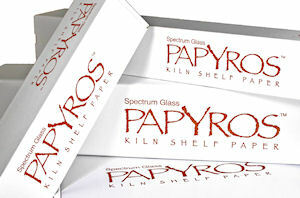 Correctly applied and correctly used, both kiln primers and kiln paper give glass a smooth finish. Both kiln washes and kiln papers can potentially be health hazards. As with any ceramic fibre based products, kiln papers need to be handled sensibly. You should avoid breathing residual dust when cleaning post-fired kiln paper from your shelves, by wearing an approved respirator, and the residue should be disposed of appropriately. The same is true for cleaning off kiln shelves which have been coated with primer. After lots of testing, we decided to use and sell the Hotline range of primers, together with Bullseye ThinFire Shelf Paper and PAPYROS Kiln Shelf Paper. Whilst we think that using primers gives us a better finish than firing papers, we use both in our studio. Click here for some generic instructions on the preparation of kiln shelves using primers. Click here for information specifically pertaining to the use of PRIMO Primer. Please note that the Full Size 52cm wide pieces of Papyros are too long for Express Shipping.